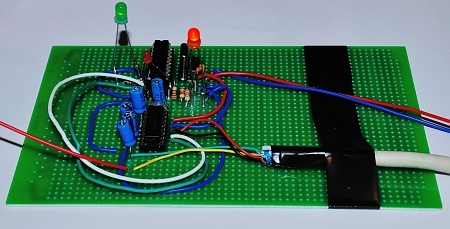 This page is about a microcontroller based circuit that can communicate with the BK1786B programmable power supply. The communication is done by using a RS-232 link. This first version of my circuit polls the BK1786B every 100 ms to see if the maximal output current is reached. If this is the case, a LED and an buzzer are activated. In fact this circuit is a hardware variant of my shortcut detector software. I realize this is a complex solution that could easily be replaced by PC software, but this circuit could be expanded with additional functions. You could add a LCD module that shows the power output (Watt) or you could add a timer that switches off the supply after some time.